At a time when the standoff between India and China on Doklam is on and Beijing, in its bid to isolate India, is trying its best to win over the South Asian country’s neighbours, New Delhi’s move to invite Sher Bahadur Deuba for his first foreign sojourn after becoming Nepal’s prime minister in June, has assumed very high political and diplomatic significance. Interestingly, just three days after external affairs minister Sushma Swaraj’s trip to Kathmandu on August 10 for the two-day meeting of foreign ministers of the BIMSTEC (Bay of Bengal Initiative for Multi-Sectoral Technical and Economic Cooperation), countries, Chinese vice premier Wang Yang landed in Kathmandu. This was the first high-level visit from China in five years and also the first by a high ranking Chinese official since Deuba formed a government in Nepal. In the face of this, the Nepal prime minister chose to visit India. During a regular press conference of China’s foreign ministry on August 23 when a reporter asked spokesperson Hua Chunying as to what was her comment on Deuba’s visit to India, she gave a very cautious response. “International relations in the 21st century are not zero-sum games and do not mean that one country need to counterbalance another. Both Nepal and India are important neighbouring countries of China. We welcome the sound development of the Nepal-India relations and hope that India can put the growth of the China-Nepal relations into perspective,” Chinese foreign ministry spokesperson said. She was right. But given that India treats Nepal as its close neighbour with whom it has always stood shoulder-to-shoulder, China should realize that the Himalayan country shares relation with India that goes beyond trade and investment. They share strong historical, cultural, ethnic and linguistic bond, which China clearly lacks. Though the Himalayan nation’s ruling elites have often tried to play the India card against China and China card against India and this way they have served their interests, yet a large section of Nepalese are pro-India. Especially people belonging to Nepal’s Terai region have family links with people from Bihar and Uttar Pradesh. According Nepal’s 2011 census, the country’s second largest spoken language is Maithili which is also spoken in 9-10 districts of Bihar. In these districts of Bihar, marriage relation with people from Nepal’s Terai region is not uncommon. Similar is the case with Bhojpuri speaking areas of the two sides. Even among ‘paharis’, constituting three-fifth of the total Nepal’s population, family linkages with people from India’s Uttarakhand and Himachal Pradesh states, are very strong. Nepal’s Ranas who ruled the Himalayan country from 1846 to 1951, are well known for their linkages with India through marriages. The country’s last Rana ruler and Mohan Shamsher Jang Bahadur Rana’s son Pashupati Shamsher Rana who currently heads the Rashtriya Prajatantra Party (RPP) is married to Usha Raje Scindia, late Madhav Rao Scindia’s elder sister. And then Pashupati Shamsher Rana’s sister is married to senior Congress leader Karan Singh, son of erstwhile king of Kashmir, Hari Singh. China has no such linkages, though, from 2010 onwards, it tried to increase its cultural footprint in Nepal by opening language schools, but they have largely remained ineffective in becoming a craze among Nepal’s youth. Here India has an upper hand in Nepal where New Delhi has generously funded to build schools and colleges. During prime minister Deuba’s visit, New Delhi, under its capacity building mechanism, agreed to build a technical institute and G P Koirala Centre for Respiratory Disease in Dhangadhi in Nepal. India has also agreed to expedite the process of building Pancheshawar project, a hydro project which is lying in limbo since signing of a treaty between the two countries in February 1996. 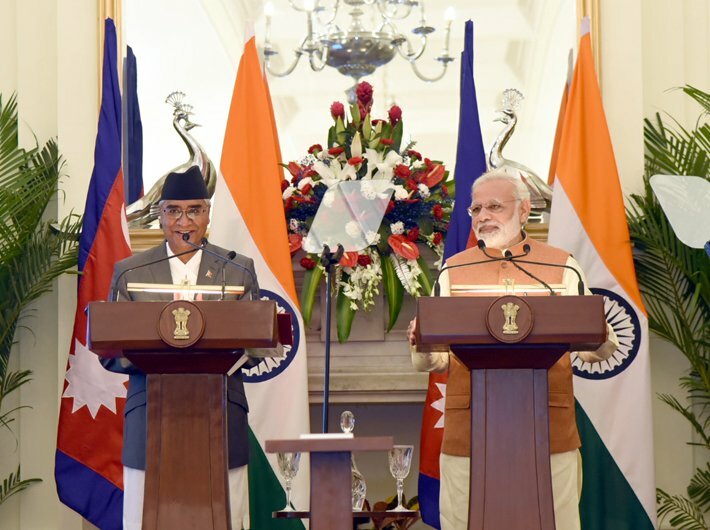 “The Detailed Project Report of the Pancheshwar project will be prepared soon,” prime minister Narendra Modi said during a joint statement with the visiting Nepalese prime minister in New Delhi’s Hyderabad House where the two prime ministers also inaugurated 132 KV Kataiya(India) and Kusaha(Nepal) transmission line and 132 KV Raxaul(India) and Parwanipur(Nepal) transmission line. Modi also accepted an invitation from his Nepalese counterpart to visit the Himalayan country to lay the foundation stone for Aruna III power project. For the reconstruction of houses in Nepal, after it suffered a devastative earthquake in April 2015, India has already pledged more funds. In fact, by promising to help Nepal in its road and rail connectivity, energy, flood control, skilling and capacity building programme, India wants to stand by the Himalayan nation as its reliable partner. China must be watching all this very closely more so in the background of the fact that India left no stone unturned to make Deuba’s visit highly successful. It rolled out the red carpet welcome and gave him accommodation in Rashtrapati Bhawan, a rare gesture.